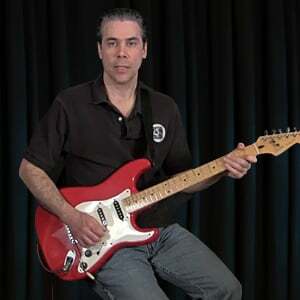 In this lesson we will use a backing track to practice switching between the G, C, G, and D major chords. We are going to focus on two things: getting from one chord shape to the next and doing it in time with the music. Anytime you practice it is valuable to have a reliable standard to measure your progress. Usually this involves playing some specific musical idea, scales or chords along with a metronome in order to gradually improve. In this case, we have a group of chords that we will practice over a backing track. In my experience it is much more motivating, rewarding and fun to play along with a backing track than a metronome. A metronome certainly has it's place in the musician's tool kit. But, we are eventually going to play music. So why not practice our chords along with some musical accompaniment?! The backing track is a simple audio recording of a bass and drums playing the same thing over and again. The bass is playing even 1/8 notes walking from chord to chord; each chord gets two measures, making a total of 8 measures then repeating. The drums outlines a simple back beat pop-rock rhythm with a cymbal crash to mark the chord changes. Each lesson page has it's own audio file to play in the page or download as an MP3 to use offline whenever you desire. The ultimate goal with this tutorial is to play along with each chord change on the downbeat of every measure. Play each chord as notated on each 1st beat or count of 1. Change chords at the right time and play right along with the music in rhythm. We are going to play whole notes, one chord per measure, each chord starting on the first beat of each measure. The backing track goes from G major for 2 measures, to C major for 2 measures, back to G major for 2 measures, to D major for 2 measures. Then it repeats over and again. The backing track is played at 80 BPM (Beats Per Minute). The audio file near the bottom of the page can be played in the page or downloaded as an MP3 to use offline whenever you desire. The backing track can also be found in the Guitar Tricks Jam Station. It's called "Chord Practice GCD Major 80 BPM".